'A Taste of Sunrise' brightens..
MTSU, the Military, and the Mi.. Success Doesn’t Just Happen. It Happens Over Time. “Success doesn’t just happen, it happens over time” – a great message portrayed to us by our team life coach and pastor, Jason Scales. Jason always has a great message for us, but this message had a truthfully special meaning. I mean, think about it, when you think about success over a sustained period of time, there is no better example than Coach Davis and our basketball program. But for Jason’s quote, I correlated it back to my whole life. Chase Miller with Dominique Scales, or as he calls him, “Coach D”. I grew up in Dallas, Texas. Being from Texas, football is a religion. If you’ve seen “Friday Night Lights”, life in Texas during fall Friday nights is exactly like what you’d imagine. The city essentially shuts down, and the whole city floods the football stadium. Growing up in a football-driven family (my dad played football at the University of Texas), I grew up with the dreams of quarterbacking my high school to state championships. I mean, football was in my blood. How could I not? As God would have it, heading into my junior year of 2-a-days I suffered a tough injury to my throwing shoulder. Football wasn’t going to be in my future any longer. It was devastating. I didn’t understand it at the time, but as time went on I began to understand that everything happens for a reason. This was just the start of me realizing success takes time. If you see me out and about, the last sport you’d expect me to play is basketball. It’s actually funny, around campus I’m commonly asked, “What sport do you play?” I’ve gotten to the point to where I just tell them to guess. It’s actually pretty entertaining to hear the guesses. I always hear “baseball?”, “tennis?”, “are you a quarterback?”. Nope. The look on their face when I tell them it’s basketball is always priceless! I think that’s the perfect explanation of my journey to the hardwood. Unlikely. Unexpected. I grew up athletic, to an extent. I was never going to out jump anyone or be the best athlete in the gym, I think that’s become pretty obvious by now. That’s why playing quarterback and being a pitcher in baseball was my best bets to an athletic background. If you know anything about me, you know I’m always up for a challenge. That’s what basketball gave me, and continues to give me on a daily basis. I love that for me, basketball doesn’t exactly come naturally. It just means I have to outwork any and everyone. Extra lifts. 6 AM workouts in the offseason. Eating the exact right way. Doing everything I can to be the best possible version of myself on the court. Is it a commitment? Absolutely. Is it worth it? Absolutely. Chase Miller pulls up for three. In high school, up until my junior year, for obvious reasons football was my focus. I started at quarterback for parts of my sophomore year, so football was my first love, and my absolute focus. Basketball was always in the back of my mind up until my junior year. Sophomore year (basketball-wise), I was one of the last guys off the bench on the Junior Varsity squad. Quite frankly, I thought that was the end of my basketball days, obviously until my shoulder injury. I liked basketball, but I didn’t love it. That all changed when September of my junior year rolled around. As fate would have it, I would get in touch with Dominique Scales or better known as Coach D. Coach D has been an instrumental part of my life ever since. He’s always been there for me. He instilled a work ethic in me. We spent countless mornings, and late nights in numerous gyms and I can honestly say that without him, I would not be where I am today. Coach D instilled work ethic, resilience, and persistence in me — all 3 is essential to achieving success, which takes time. My junior and senior years on the hardwood in high school were great for me, I started on Varsity as a junior and as a senior averaged over 20 points a game, but little college interest arose. I had plenty of smaller schools in Texas I could’ve gone to, but I had higher aspirations, which led me to prep school, a gap year between high school and college. When people ask me about prep school I tell them it was the best and worst six months of my life. Don’t get me wrong, I made lifelong friends and memories, but it was an absolute grind for six straight months. I went to Elev8 Academy in Delray Beach, Florida. Elev8 wasn’t your “typical” northeastern prep school; it was more a basketball camp. It was 57 basketball players composed of 5 teams. Our schedule essentially consisted of eating, sleeping, and basketball. Chase Miller poses with some young Raiders. We scrimmaged in front of college coaches and played in a lot of showcases nationally. The whole point of Elev8 for me was to grow mentally and physically. Elev8 was the most eye-opening six months of my life. I got out of my Dallas bubble. I learned first hand, that there is no substitute for hard work. Trust me, going up against 7 footers and grown men day in and day out, while you’re a 160 pounds soaking wet straight out of high school, will teach you quite a bit about yourself. I grew immense amounts mentally while at Elev8. I truly toughened the heck up! Like any kid straight out of high school, being homesick felt insurmountable at times. I can honestly say making it through Elev8 was one of the best experiences of my life. I met lifelong friends, made unforgettable memories, and best of all I can turn on almost any NCAA Tournament game on and odds are I’ll have a friend playing. It’s a really neat feeling seeing the friends I went through so much adversity with achieving so much success. All of us Elev8 alums talk about it all the time; the hard times make the great times that much better. Before pursuing my college hoops dreams, I had always kind of envisioned myself at an SEC type of school. When I first started looking for schools I had 3 things that really mattered to me. I wanted southern hospitality, a nice, big campus, and a school where I could have the absolute best 4 years of my life socially. Before speaking with Coach (Ronnie) Hamilton a little bit I didn’t really know too much about MTSU. Coach Hamilton and I had emailed back and forth a little bit for months, and he was a good friend with one of my coaches at Elev8, Brett Newman. Coach Newman was adamant MTSU was a great fit for me, safe to say he wasn’t wrong. I’ll never forget the day Coach Hamilton and I first spoke on the phone. For those of you that don’t know, Coach Hamilton is one of the best and down to earth guys in the business. It became pretty apparent after our short 10-minute conversation that MTSU was a special place. Chase Miller goes crazy on the sideline trying to hold himself AND his teammates back. Coach Hamilton started the conversation like most coaches do. He introduced himself and tried getting to know me a little bit, nothing out of the ordinary. What came next though, was something new to me. He said, “MTSU is a great place. The people are what makes MTSU and Murfreesboro so special.” To me, this meant a lot. I wanted to go to a school where there was a special feeling around not only the campus but the community as well. A few weeks, after my first phone conversation with Coach Hamilton, my parents and I came up to Murfreesboro to visit. To be honest, I didn’t really have too many expectations. I mean, I had never even really been to the south! Within a few moments on campus, I knew this place was special. Funny story, my parents and I actually got lost on our way to campus so I ended up essentially getting a campus tour trying to find the Greenland Lot and the Murphy Center. We literally made our way around the whole campus. I mean the WHOLE campus. During my day on campus, I met with everyone! Academic advisors, strength coaches, all the assistants, and of course, Coach Davis. Coach Hamilton wasn’t wrong when he said that people are what make this place special! To end the visit my parents and I spoke with Coach Davis for about 45 minutes. Quite honestly, it was pretty hard not to be impressed with Coach. He is one of the best in the industry. We talked a little bit about basketball, but for the most part, it was conversations talking about Murfreesboro, the community and everything in between. I remember thinking “holy cow, my parents and I just had a 45-minute conversation with a basketball legend”. Pretty crazy stuff. As I’m sure most people can assume, the visit went great and there was nowhere else I wanted to spend my 4 years of college. I was going to be a Blue Raider! It’s crazy to reminisce about all of the success I’ve been able to be a part of since getting to campus. The memories I’ve made in a short two and a half years here is baffling when I really look back on it. I’ve enjoyed more than just basketball. I’ve made lifelong friends and memories that will last a lifetime. I’ve been able to join a great fraternity and be involved in a fantastic community — it’s really crazy to think a little under three years ago I didn’t know one person in Murfreesboro, let alone the state of Tennessee! When people back in Texas ask me about Murfreesboro, I never really know what to say or how to describe it, besides “man … Southern hospitality is a real thing.” Murfreesboro is a special, tight-knit community and I think that is apparent to all of us on the MTSU basketball team. We truly want to make all of Murfreesboro proud. I think about how fortunate I am to be in the situation I am in almost every day. I mean, how many people can say they’ve been able to be a part of one of the biggest NCAA tournament upsets ever, another NCAA Tournament win, and be a part of such a supportive community? Not many. By no means am I saying that I’ve obtained success, but I sure feel like being a part of so much success with Coach Davis and the MTSU Basketball program has given me a taste of what success feels like. As Coach always says, “never get complacent”. These are words I try to live by. Throughout my experiences in athletics and in life, if there’s one thing I’ve learned it’s that persistence truly pays off. This is true in all facets of life. To me, there is so much left to accomplish here at MTSU, this season especially. This team is special and has all the mindset that we can beat anybody in the country. Chase Miller poses inside Murphy Center with a couple of young Raiders. 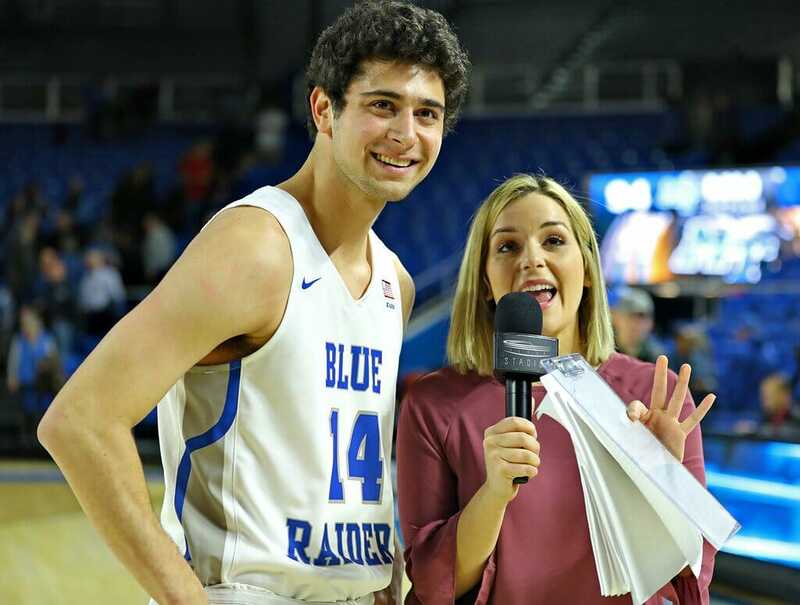 If you are an athlete here at MTSU and have a story you are willing to share, please contact Stephen Smith at raiderstribune@mtsu.edu.